Cesar began his Aikido training in 1995 under James Cornfield Sensei in Albuquerque, where he first met Philip Vargas Sensei. In the late nineties he was exposed to the Aikido of T. K. Chiba Shihan at Southwestern Aikikai through Dennis Abbott Sensei. Over the years, Cesar had the opportunity to train in different Aikido styles with multiple teachers whom he deeply respects. Meanwhile, his admiration for Chiba Shihan’s Aikido and the Birankai organization only grew. In 2005 Cesar began training with Kristina Varjan Shihan and Rikko Varjan Sensei, both students of Chiba Shihan, at New Mexico Aikikai. 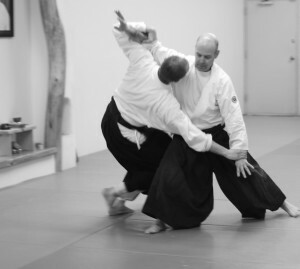 In 2008, as part of the dojo’s transition to Aikido of Albuquerque, Cesar began training under Philip and Bernadette Vargas Senseis. Cesar is an accomplished information technology professional who believes vigorous Aikido practice leads to more than the development of martial skills. For him, the principles that allow a person to defend against physical confrontations improve communication, leadership and conflict resolution at home and at work. This leads to our betterment as a human beings in all aspects of life. Born in Brazil, Cesar Goulart has a long and diverse martial arts training background. His experience began as a child learning Judo and includes western boxing, Jiu-Jitsu, Aikijutsu and Aikido.